Time flies...We have enter the last trading month of 1Q'13. 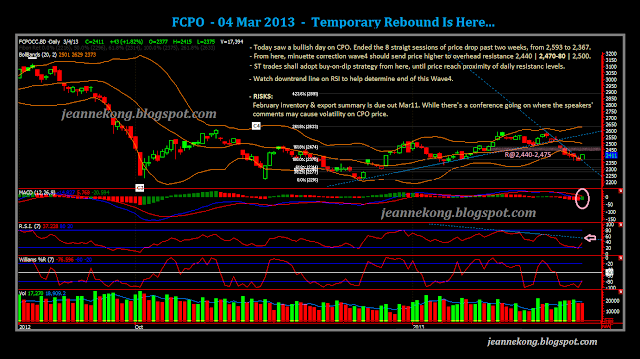 My 2012 year-end closing post felt like last month, while CNY was like last week. Well, I guess I can't blame time, maybe it was because FKLI was just about at the same level it was after the end-Jan plunge. Today, a mid-morning trade error on PetGas, which saw it went to the low of 13+ bucks, dragged down with it the KLCI & FKLI. My long position went to loss as the stop loss triggered. Volume on PetGas wasn't really super-high, meaning that the trade error was covered cheap, much cheaper than the losses it caused on FKLI traders. Whether you are on long, or u queued for short below support anticipating a breakdown, you are most likely doomed. That's a really cheap wash & rinse....expect more of these to come as we get nearer & nearer to GE13. 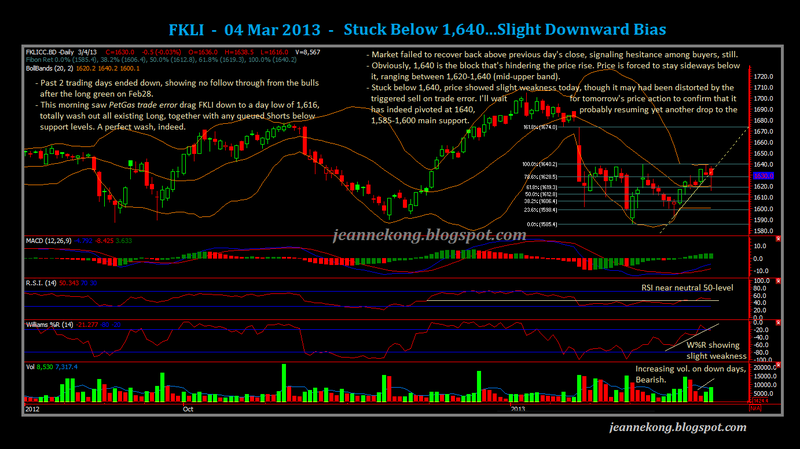 FKLI showed slight weakness, even if you ignore the trigger down part. However, with today's price distortion, I'll give it another day to confirm that price has indeed pivoted at 1,640 last Friday (Mar 01). On the mid-term, the 50pt flat range between 1,590-1,640 still holds the price movement since Jan21 plunge. Based on the flat & sideway-ish BB, I believe the 1,640 strong resistance is still not ready to be overcome by the bulls. In fact, there's no sign of a potential retest of the level in sight, as there was no follow through after a long green breakout day on Feb28, the best chance of challenging the resistance overhead, missed. Hence, I'm more prone of looking at it as a start of another drop to test on the 1,590-1,600 long-term support, rather than a potential breakout above 1,640 & climbing back above the towering-over Jan21 long red. Also, a bleak outlook on the backdrop of a looming election. Temporary, the sideway range is defined by the mid-upper daily BB, between 1,620-1,640. To avoid any 'funky' trade-what-so-ever-error, it is best to either short the extreme high of 1,640, or long the mid-band support of 1,620. Of course, a break below 1,620 will see next support comes in at 1,590-1,600. Momentum weaken slightly on today's drop. RSI just slightly above its mid-level support, while W%R has show a potential break-below of its uptrend line. Volume also increases on the last two red candles, a warning sign of a potential pivot at 1,640. All in all, tomorrow's close shall give a clearer picture on the week's direction. 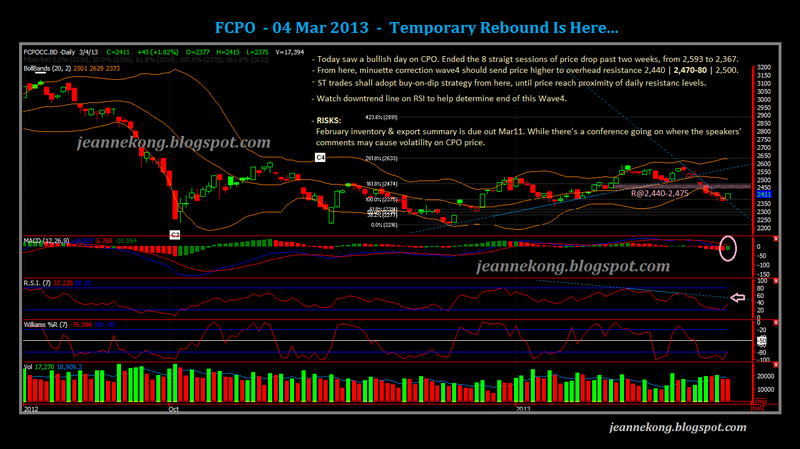 CPO had a bullish day today, closing at two-week high of 2,411. Today's close has confirm a breakout above the ST downtrend line that has been respected throughout the drop of 2,585-2,367. We may see start of a rebound up-wave from here, which may face some resistance at 2,440 | 2,470-80 | 2,500-20. Note the downtrend line restricting RSI too, to gauge the potential peak following today's rebound. Potential price catalyst may come from the speakers' speech from a palm oil conference currently on-going. On March 11, MPOB will release Feb'13 crop data & export summary. Barring any notable external noises, we are looking at a ST uptrend for the week. 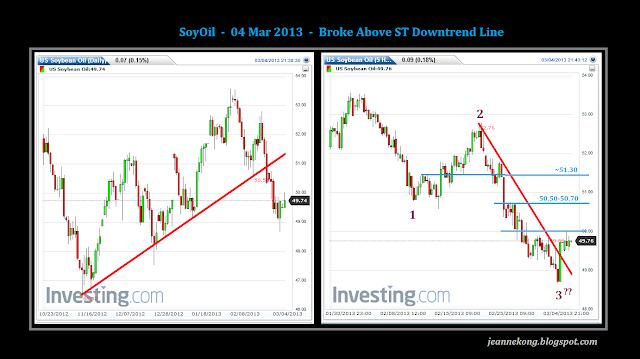 A look at SoyOil, its more or less in similar motion as CPO. Broke below a MT uptrend channel, price drop and unfolded 2or3 waves, currently looking at a temporary rebound after breaking above ST downtrend line. A short-term uptrend shall define the week's price movement. The truth is, I'm pretty tired of the crankiness of FKLI as we see the ruling party keep delaying the GE13. I hope they have the election tomorrow, if possible. Just so we can get back to the usual market sentiment, without an election plunge bias or panic, certainly without any cranky trade errors or 40pt-plunge-a-day day. In the mean time, I'll shift my focus to CPO, & lighten on FKLI trades. 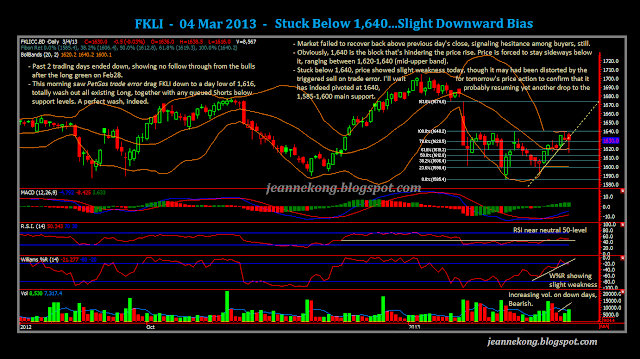 FKLI opened at 1,640 & made a high of 1,645 this morning. Gap up for no reason....~_~"
Now price is comfortably back above the daily uptrend line (yellow TL on chart), BB widens a little. Now that 1,640 is no more an issue, look at the opening price of the Jan21 candle (@ 1,650-60) as upside resistance. Still, stay cautious as it has clearly become a highly-manipulated playing field here on FKLI. Use deeper stops, where possible, to avoid deliberate shake-outs. I'm officially staying out of FKLI for the moment.